Cruises From Barcelona - Top 10 Picks By Seasoned Cruisers! Cruises From Barcelona – Top 10 Picks By Seasoned Cruisers! Cruises from Barcelona can take you to many different destinations in and around the Mediterranean, choosing which one to take may be a difficult decision as there are so many lines and so many itineraries to pick from. Here are the 10 Best cruises from Barcelona. Royal Caribbean—a 12 night cruise that offers stops in Cannes, Livorno, Piraeus, Kusadasi and Santorin as you cruise the Mediterranean. Princess—a 12 night cruise called the “Grand Mediterranean” takes you from the beautiful Barcelona cruise port to Monte Carlo, Monaco, Florence, Rome, Naples, Greece and Turkey, to name but a few ports of call. Oceana—offers a 15 night cruise called the “Lands of Time” which stops in Ibiza, Crete, Istanbul and other stops and includes days at sea cruising the Mediterranean. Costa Cruises—one of the best Mediterranean cruises visits Villefranche, Capri, Port Mahon, etc., in a 15 night sailing from Barcelona. Silversea—offering an 11 night trip which stops in Palma de Mallorca, Valletta, Hvar, as well as others and finishes in Venice, Italy. Seabourn—cruises from Barcelona and invites you on a 14 day trip with stops in Rosas, Sete, St. Tropez, Monte Carlo, Sorrento and many others on their “Grand Mediterranean Quest” sailing. Carnival—offers a 12 night cruise with stops in Venice, Koper, Naples and Cannes while cruising the Mediterranean Sea. Holland America—“Mediterranean Tapestry” cruise departs Barcelona and goes to Livorno, Naples, cruises the Strait of Messina and visits Venice before departing for home. Regent Seven Seas—this 10 night cruise stops in Cartagena, Grenada, Las Palmas among others and carries on to Lisbon, where you disembark. Crystal Cruises—one of the best Mediterranean cruise lines takes you on a mini 5 night getaway departing Barcelona for a cruise through the Mediterranean Sea, then stops in Cannes, Corsica and Civitavecchia. 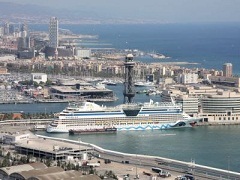 Cruises from Barcelona can show you the world, and stop in many exotic and exciting ports of call. With so many things to do in Barcelona, adding a few days at the beginning or end of your vacation to admire the city will be a lovely companion trip to your cruise. The Mediterranean is a lovely place to cruise, for those who are new to cruising or for those who just want a change of pace from a Caribbean adventure or who have always wanted to see the European sights up close. Cruises from Barcelona certainly deliver, on all counts!